Professor Gerry McCormac, Principal and Vice-Chancellor of the University of Stirling and Simon Bray, Director of Santander Universities. 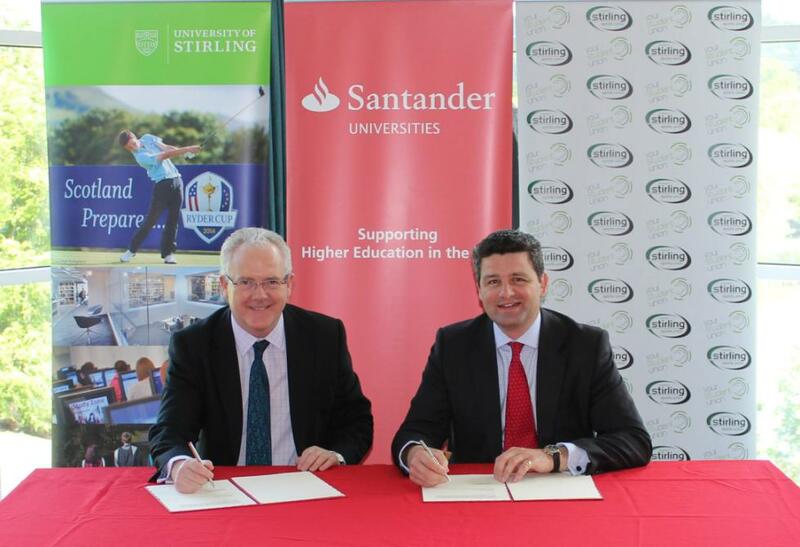 The University of Stirling has signed an agreement with Santander Universities to provide funds for scholarships, travel grants and enterprise activities, plus new additional funding to support a Stirling Students’ Union initiative. Professor Gerry McCormac, Principal and Vice-Chancellor of the University of Stirling and Simon Bray, Director of Santander Universities, signed the agreement on campus today. This year’s agreement includes funding for the Students’ Union to support their support their Recognising Achievement in Teaching Excellence (RATE) initiative, which celebrates the quality of teaching taking place at the University. The initiative also helps to enhance the learning and teaching experience at the University, based on the experiences of current students. The University is now entering its fourth year of partnership with Santander Universities. For more information on Santander Universities, please visit www.santander.co.uk/uk/santander-universities. For more information on the RATE awards, please visit www.stirlingstudentsunion.com/aboutus/campaigns/education/.